Ever since buying the Conical Fermenter quality of brews has not been quite what I've been wanting - however this also coincided with trying to brew beers with much more hop aroma. A clone of Brewdog's Hop Fiction was not quite what I wanted. The second attempt is better - but still not perfect. A slight downside is there is a bit of Russian Roulette, I didn't label beers from this batch, nor from the Mouteka brew - which isn't so good as they both have Blue crown caps. 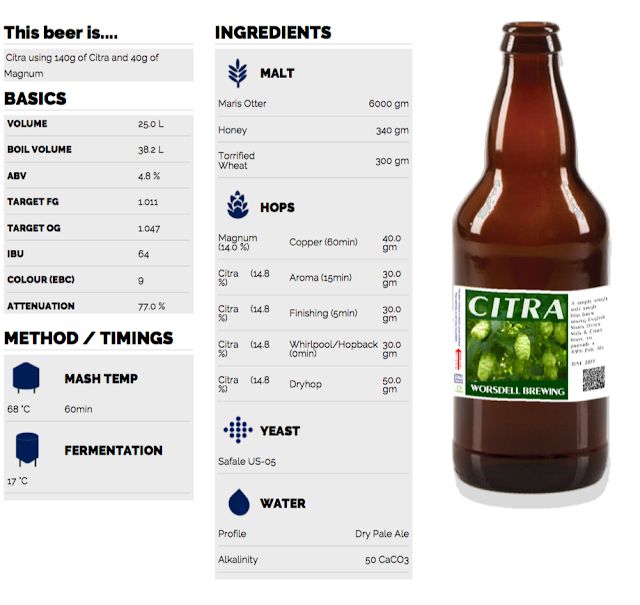 I reckon there's an equal number of Mouteka vs Citra bottles left. c) Dry hopping is good. .... so for 2018 will cap dry-hop at 2gm/L. .... also will not use Honey... somewhere along the line I've read that rather than simple sugars given yeast a head-start they might just exhaust themselves on the simple sugars and give up finishing with the complex sugars from the malt.